Don’t let Max’s playfulness or Betty’s sultriness fool you; beyond here, there be monsters. Finally, I get to do something spooky for Halloween. Again, I apologize for how unexpectedly eventful this month has been, but we finally get to talk about creepy stuff that’s totally relevant. If you’ve been following the gaming scene recently, you’ve likely been hearing the name Max Fleischer get thrown about quite a bit. You’ve also probably heard the name attached to hellish imagery and intimidating challenge as well. You can thank the dual successes of Bendy and The Ink Machine and Cuphead for bringing this man back into the limelight as both draw heavily from Max’s body of work for inspiration. So, what was that work exactly? Well, Uncle Max, as he’s occasionally known by, is a Polish-American animator born in 1883 and one of the founding fathers of modern western animation. Today, most will recognize him for the creation of Betty Boop, Popeye the Sailor, and possibly the most iconic animated depiction of DC Comics’ wonder boy Superman. And when I say ‘founding father’, I mean he developed the most important technological advancements of his time including The Stereoptical Process, the classic ‘Bouncing Ball’ style sing-a-long, and – most notably – the rotoscope that allowed for more detailed movement with less effort by artists. Basically, everything you associate with the earliest cartoons you can likely remember exist because of dear Uncle Max. That’s all well and good, but why the interest in him as a horror icon? Well, there are quite a few reasons. Firstly, much of his early work, prior to being strictly limited by the now abandoned Hays Code, dealt heavily in dark surrealist imagery. Uncle Max was no stranger to including stories and art depicting malevolent spirits, violent demons, and occult practices. 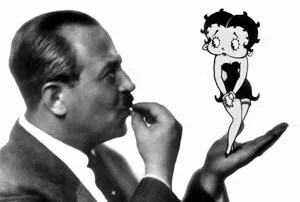 Fans of early Fleischer Studios productions – myself included – will often cite films like Bimbo’s Initiation, Red Hot Mamma, Minnie the Moocher (yes, that IS Jazz legend Cab Calloway performing the music and providing rotoscoping for the dance moves), and probably the most cited of his works – Swing You Sinners. You’ll notice that the way a lot of these characters move feels unsettling as well. Well, that brings us to another factor to the freakiness of Fleischer’s Films; his use of an animation technique called ‘Rubber Hose Animation.’ Named after the rubber hose-like construction of many character’s limbs, the lack of any points of articulation (wrists, elbows, knees, etc.) means almost everything moves with an inhuman fluidity. Imagine a person whose limbs and body seemed to slither around themselves while they walked and you can see why this would be so unsettling – especially if the person doing it was otherwise conventionally cute and innocent looking like most characters from this era of cartoons. But probably the big thing that most don’t think of is the horror potential in the real-life rivalry between Max Fleischer and Walt Disney. Contrary to popular belief Disney’s Steamboat Willie in 1928 was NOT the first animated film to sync sound and film together; that accolade belongs to Max’s Good-Bye My Lady Love a good four years prior in 1924 (which I sadly could not find). Walt was also quick to jump on and use rotoscoping once Max’s copyright on it ran out. He attempted to claim credit for it while using it to finish Snow White in 1937. The Disney Company would then spend several years lobbying to extend copyright length to ensure no one could make a better version of the public domain properties they adapted (shady business practices; just one more reason for me to hate Disney). And through all of this taking of Fleischer’s hard work and unfairly discrediting him, Disney put his studio out of business in 1942 when it was incorporated into Paramount as ‘Famous Studios.’ Max would then pass away due to arterial sclerosis of the brain in 1972. Basically, the idea of a hard-working artist who pioneered ways to make his art “come to life” as it were getting shafted by his old business rival to the point of being nearly forgotten by history is a good back story for a vengeful-spirit-from-beyond-the-grave story. So good, in fact, that some of the more obsessive nit-pickers among us have already made that connection to some of the stuff Max did and the things it inspired. So, whether you’re looking for a good creep show or looking to brush up on your animation history, it would be worthwhile to study Uncle Max’s early offering. Just maybe watch with the lights on.